Obermeyer Kids Size Chart Obermeyer Youth Size ChartObermeyer Kids Baselayer Size Chart The girls' Obermeyer® Kids Sierra Jacket with Fur updates her insulated, snowproof ski jacket with retro sport style. Regular Fit. HydroBlock® Sport shell:• Micro Twill Full Dull poly face in a print- or color-blocked, contoured design.• HydroBlock shell provides 10k waterproof / 10k breathable protection.• Skier Critical™ seam sealing tapes strategic inner seams. EpicLoft™ insulation:• High-loft polyfill increases surface area to improve warmth retention.• Quilt stitching in a curved, engineered design.• Pairs with a fleece panel at the inner, back wall.• Body-mapped design places varying insulation weights where they are most needed.• 220 g/m² weight through the body.• 160 g/m² weight through the sleeves.• 80 g/m² weight through the hood. I-Grow™ Extended Wear System extends the cuffs for cross-season wear. Removable hood with earwarmer panels and stretch gasket. Supersoft, plush faux fur trims the hood. Stand collar with warm fleece lining and zipper garage. Full-zip front closure with inner draft flap. Long sleeves with hook-and-loop tab cuffs. Zip chest pocket. Hidden, mid-body pocket with attached, functional compass. Zip hand pockets. Inner, stretch ski-pass pocket. Inner, drop-in pocket with hook-and-loop closure. Water-resistant, integrated powder skirt. Curved, droptail hemline. Shell: 100% polyester;Lining: 100% nylon;Insulation: 100% polyester. Machine wash and tumble dry. Imported. Measurements: Length: 16 1⁄2 in Product measurements were taken using size 4T Toddler. Please note that measurements may vary by size. 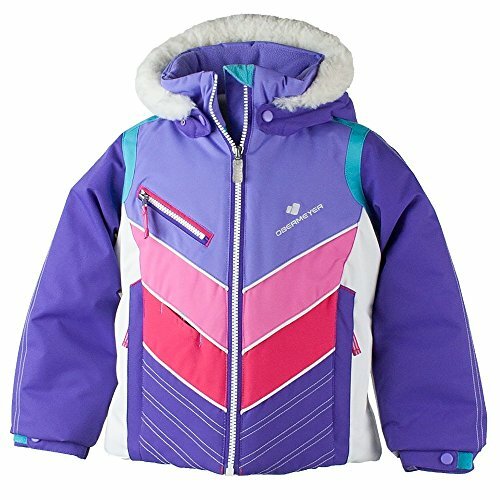 The girls' Obermeyer® Kids Sierra Jacket with Fur updates her insulated, snowproof ski jacket with retro sport style. HydroBlock® Sport shell:• Micro Twill Full Dull poly face in a print- or color-blocked, contoured design.• HydroBlock shell provides 10k waterproof / 10k breathable protection.• Skier Critical™ seam sealing tapes strategic inner seams.